Successfully Added Rugged Portable Battery Bank "Amps" - 7800mAh, USB Port, LED Light to your Shopping Cart. Portable Battery Bank with 7800mAh of power with a rugged weatherproof design. Charge your electronics gadgets on the go, even if you are miles away from a plug. If you’re often on the road, out camping, or even if you are a real tech junky, then the “Amps” power bank is a gadget you won’t be able to live without. Using the 3G or LTE function of your phone or tablet can drain your battery extremely fast, and there is nothing more annoying than having a dead battery in the middle of the day. But rescue is on its way! Thank to the “Amps” 7800mAh portable battery, you’ll be able to charge all of your electronic gadgets on the go. Just connect your device to the “Amps” through the USB port or use one of the 4 included adaptors. Packing enough juice to charge your phone up to 5 times, having a dead battery will be something of the past. Even better, with its rugged weatherproof design, you can take the "Amps" where few portable battery packs dare to tread. Weighing just 200 grams and only as big as a wallet, the “Amps” easily fits in your backpack or even pocket. 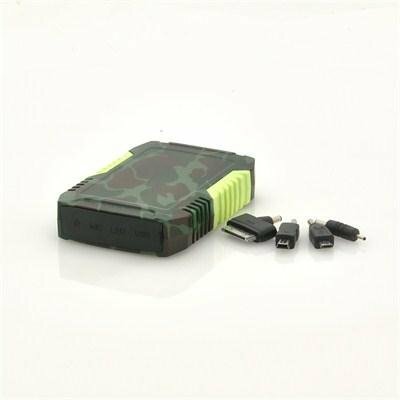 Take it with you when on the road, out camping or to school and you’ll never run out of battery anymore. As a nice little extra, the “Amps” features a built-in LED light which can be used as an emergency LED torch. This rugged universal portable battery is your solution to a fully charged phone 24/7. Brought to you by the leader in wholesale cell phone accessories and electronics - Chinavasion!